Oil industry titans are still not in agreement over what to expect from oil prices in the near future, with a wide array of guesses calling for both a spike in prices and a renewed downturn. At the Oil & Money Conference in London, this disagreement was on display. 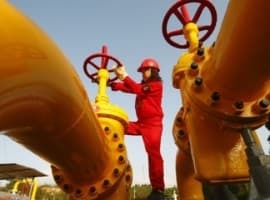 Ian Taylor of Vitol, an energy trader, said that he expects oil prices to fall to $65 per barrel, while his counterpart at Trafigura said that triple-digit oil prices were likely before all was said and done. A few weeks ago, $100 oil was all the rage, but the sudden volatility and turmoil in global financial markets has likely rocked some of that bullishness. Brent lost almost $4 per barrel over two days. There are plenty of reasons why oil could resume its upward climb, with the supply losses in Iran and Venezuela at the top of the list. But a new report from Barclays argues that even if oil prices spike, the spike would only be temporary. There are a few reasons why the bank believes that triple-digit prices are unsustainable. First, while the outlook for the oil market looks tight, many of the variables that analysts cite as reasons for higher prices are themselves debatable, Barclays argues. Iran’s oil exports have fallen sharply, perhaps by as much as 0.5 million barrels per day (mb/d) already, or maybe more, but they won’t go to zero. The recent softening position from the U.S. government suggests that some sanctions waivers could be forthcoming. India, Turkey and China are all likely to keep buying at least some cargoes from Iran, Barclays argues, which should put a floor beneath exports. The difference between Iran’s oil exports plateauing at 0.5-1.0 mb/d as opposed to zero is highly significant. Second, low spare capacity is another reason why many top oil experts think prices might continue to climb higher. But “OPEC has ample spare capacity, in our view,” Barclays said. It’s difficult to evaluate this argument since Saudi Arabia has never proven its ability to sustainably produce at the levels they claim. Third, the hesitation by OPEC+ to increase production in the face of losses from Iran – a development that helped push up oil prices after the September OPEC+ meeting in Algiers – is not a sign of a desire to push prices higher, Barclays argues, but actually a recognition that things could go south pretty quickly. “OPEC members are also exercising caution in how much downward pressure they apply. They remember adding output in 1997 in the run-up to a full-blown EM crisis,” Barclays said. If OPEC+ were to ramp up production just ahead of a global economic slowdown, the group could end up crashing prices. The recent meltdown in global equities is a vivid reminder that the health of the global economy is not assured. Rising interest rates, trade headwinds, high oil prices, political turmoil, a strong dollar and emerging market weakness are all obstacles on their own. Combined, they could lead present a serious threat to global growth. The “macroeconomic backdrop has worsened since our last short-term outlook in July,” Barclays wrote. Also, while most of the variables mentioned above are exogenous to the oil market, there are factors unique to oil that could put an end to the rally. It's nice they take time away from LIBOR rate fixing and money laundering, but I disagree with their call. Keeping $100 target for 2019 based on depletion rate, the amount of drilled and not producing yet wells to take over but not until the price is right to help offset the use of oil to protect the dollar for the past 10 years. Debt,debt,debt.offset by profit,profit,profit.